The original version of this recipe calls for ground beef, which I am none too fond of. The adapted version called for ground chicken, which I am not crazy about either. So I adapted it once again, using shredded chicken prepped in the crockpot. Firstly, I cannot rave enough about the chicken. I will never use a taco seasoning packet again, this was SO much better. Miss F said, "This is so yummy, Mommy!" I served hers sans sauce and she adored these. She ate two! C ws also a fan, even though he picked the Poblanos from his sauce. I used fajita size tortillas because it is what I had on hand, but these would be great in big burrito sized tortillas. As seen on A Taste of Home Cooking, adapted from Elly Says Opa! Preheat the oven to 400 degrees and spray a rimmed baking sheet with cooking spray. Place 2 tablespoons of the cheese at the end of each tortilla and then spoon some of the chicken and bean mixture over the top. Fold the left and right sides of the tortilla in, and then roll the tortilla up, from the end closest to you, to the top. 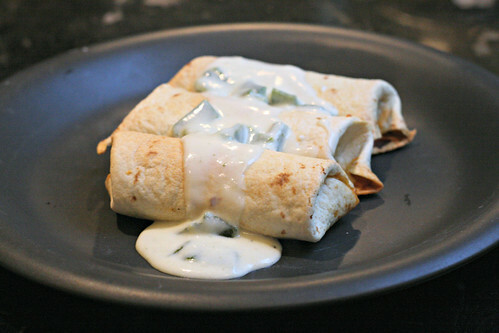 Place seam-side down on a baking sheet and lightly spray the tops of the burritos with cooking spray. Bake for about 20 minutes, until tortillas are golden brown and crispy. Meanwhile, make the sauce. Place the poblanos directly over a gas burner. Using tongs, turn occasionally until skin is blackened on all sides. Place in a bowl and top with plastic wrap or a clean towel, until cool enough to handle. (Alternatively, you can roast the peppers under the broiler until all sides are well-charred.) Peel the peppers, remove the stems and seeds, and dice them. Heat a small sauce pan over medium heat and melt the butter; stir in the flour and cook for an additional minute, stirring constantly. Slowly whisk in the chicken broth and then the diced poblano; continue to simmer, whisking frequently, until thickened. Stir in the sour cream/yogurt and warm through. Season to taste with salt and pepper. Serve the sauce over the baked burritos. Yum! I have been wanting to make these, but I had the same problem with the meat issue. Shredded chicken sounds perfect and easy!! Glad you liked them! Good idea to make the chicken in the crockpot and save a little prep time later! I love the idea of using shredded chicken instead of ground beef! I liked the ground beef version but I bet I would love the shredded chicken one even better. I can't wait to try these! Made these tonight and they were wonderful! We used chicken thighs instead of breast just because they were on sale and my husband was a big fan.